Video artist Peter Sarkisian (American, b. 1965) explores the spatial and perceptive possibilities of video, film, and sculpture. Sarkisian combines three-dimensional screens and objects with video projections that cause the viewer to question their own observational experience. This small retrospective focuses on the various approaches Sarkisian has taken to create perceptual traps for the viewer. In today's popular society, film and video has become a passive medium that negates actual experience and neglects the presence of a screen. Sarkisian takes video and turns it back on itself, bringing it to the forefront and physically pushing it into the viewer's space. This causes a contradiction in the viewer's mind, forcing reconciliation between the actual and the perceived. Sarkisian's early work, such as Sleep Defined (1996) or Green Puddle (2000), places a recognizable object in physical space. The perceptual trap is created by projecting an image, moving fabric or dripping, onto these objects and creating something that appears physically real, but prompting the viewer to consider an alternative. A later work by Sarkisian, Registered Driver (2004), takes that concept one step farther. 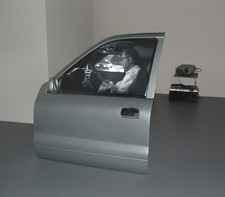 This piece inserts video footage of a real person between an actual car door and computer generated video game scenes. As the driver moves through the city streets, he runs over pedestrians, drives the wrong way, and crashes into oncoming traffic, all with complete nonchalance. The driver's casual attitude exemplifies the passivity of playing video games, yet the physicality of the car door contradicts the lack of consequence. In his more recent work, Extruded Video Engine, Large Shape 1, Version 3 (2007) for example, Sarkisian celebrates the screen by creating a three dimensional, molded plastic, sculptural surface. By projecting onto the screen from behind and eliminating the visual element of the projector, he creates a moving, audible object. He marries the image to the surface by wrapping shapes and text around and through the piece. Sarkisian lives and works in Santa Fe, New Mexico. 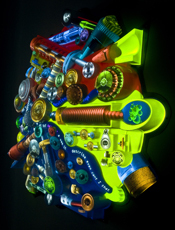 He is represented by I-20 Gallery, New York, James Kelly Contemporary, Santa Fe, and Bernice Steinbaum Gallery, Miami. Funded in part by an anonymous sponsor, Roy and Caryl Cline, FMC Corporation, Murdock Law Firm, P.C., Wyoming Public Radio, the National Advisory Board of the UW Art Museum, and the Wyoming Arts Council through the Wyoming State Legislature and the National Endowment for the Atrs. Peter Sarkisian discussess the work in his mid-career retrospective, Peter Sarkisian: Video Art, 1996 - 2008, at the University of Wyoming Art Museum.